Written by By Brandon I. Brooks , Kenneth D. Miller and Danny Bakewell Jr. While local and federal elected officials voiced their dismay with President Obama Administration’s recent designation of Promise Zone grant funding that excluded South Los Angeles, Mayor Eric Garcetti pledged aid one of the most poverty stricken regions in the city. “All parts of Los Angeles will be included in the Promise Zone where we have poverty including South Los Angeles, but to my disappointment the rules in Washington didn’t allow it,” Garcetti told the Sentinel during an exclusive interview. Since 2009, the President has provided more than $350 million in 100 of the nation’s persistent pockets of poverty and during the initial round of the title Promise Zone grant funding, only Pico Union, Westlake, Koreatown, Hollywood and East Hollywood were included. South Los Angeles ranked above the entire state of California according to data released in 2009 by City Data. The state has 19.1 percent poverty and South L.A. had 25 percent and the region with income below 50 percent of the poverty level, South L.A. had 8.7 percent compared to the state level of 6.0 percent. According to the most recent data from the Los Angeles Chamber of Commerce, showed evidence of high levels of poverty was pervasive in South L.A. The chamber’s data indicated the vast majority (89 percent) of the tracts with concentrated levels of poverty were adjacent to Downtown and in South Los Angeles. “The Promise Zone is an important project, and it is terribly needed in South Los Angeles. I am disappointed that South Los Angeles was not included in this round, and I will be following future Promise Zone announcements to ensure that South Los Angeles is included in the next round, said Congresswoman Karen Bass in a statement. “I am hopeful the Promise Zones are similar to the anti-drug grants of the 1990s. We were fortunate that South Los Angeles was included in the first round, but after a few years Los Angeles received multiple follow-up grants. The initiative designate a number of high poverty communities as Promise Zones, where the federal government will partner with and invest in communities to create jobs, leverage private investment, increase economic activity, expand educational opportunities and improve public safety. “The only places eligible for these Promise Zones had to have won a Promise Neighborhood or Choice Neighborhood grant, but unfortunately those hadn’t been given in South L.A.,” explained Garcetti. The Mayor said the aforementioned grants predated him and was done before his administration. He said those applications had been processed by the city earlier before he was elected as mayor. “What we did is created something called a Promise Zone where you had to see the geography of it. 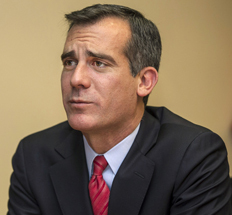 South L.A. can get money from the Promise Zone,” Garcetti said. “It doesn’t say those grants cannot be spent outside the Promise Zones, it just says that part of it has to go into the Promise Zones. Garcetti added that there are five or six core pieces of the Promise Zone which the mayor intends to assure that other parts of the city benefit from the funding. Potentially, if South L.A. was included there could have been portions that would not have been covered under the grant, according to the mayor. “I as the Mayor am not going to accept those technical rules as the reason not to expand and grow my efforts to end poverty and make more safer and livable communities, especially in South L.A.,” Garcetti stated. Garcetti targets Downtown and south of Downtown as pockets of the poorest in the city, but he added that there are other portions of the city in dire need as well. The $2 billion funding will be spread throughout a 10 year period and the Los Angeles and according to the mayor the city will receive in the “high tens to hundreds of millions” in that time span. Among the areas specified are safe passages to schools, parks and recreation, the department of agriculture, housing and public transportation.